Let’s face it, budgets are a fact of life for most of us. (Unless that retirement plan of winning the lottery finally pays off!) As you are faced with the challenge of designing a room, or even a whole house, it can be daunting when you start looking at all the stickers. As you are sorting through tear sheets and adding up prices, remember there are areas where it is best to spend and areas where you can save. That sofa, sectional, bed. dining table, etc: This is the main piece in your room, and the piece you do not want to replace. Do your research and you will realize the construction of a furniture is very important. You are not just paying for design in this case, you are paying for hardwood frames, high-end foams, tempered glass, and other materials that will last you a lifetime if taken care of properly. 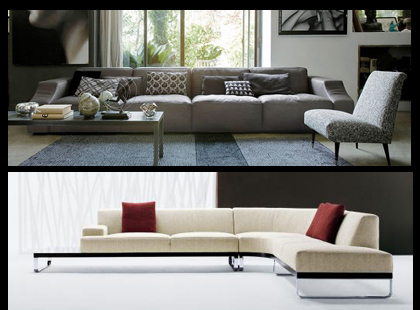 The Omari sectional from Gamma, and the Sodeo sectional from DellaRobbia. Both have quality construction with high-end materials. Lighting: The right lighting can make all the difference in the world. That soft taupe shag can appear dingy, and the details on your painting can get lost. Make sure the natural light available is used to it’s best ability. 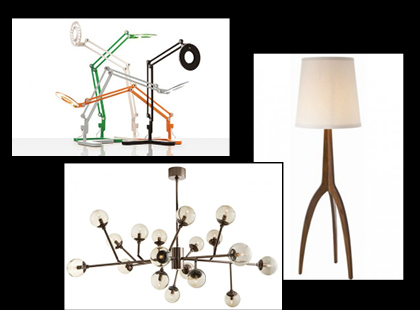 Then carefully choose your chandeliers, pendants, and lamps to enhance natures’ beauty. From top right clockwise. The Link Task Lamp provides direct, bright light, but still keeps it soft so it won’t hurt your eyes. The Linden lamp is perfect when you need ambience lighting with style. The Dallas Chandelier is unique, glamorous, modern, and makes the perfect statement in any room. A good wool rug. A soft wool rug does so much for a room. It anchors the furniture, provides design and interest, and gives your tired tootsies a soft place to rest at the end of the day. 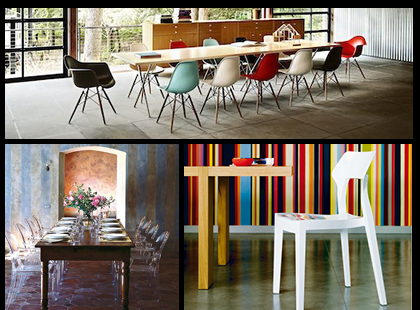 Plastic chairs: When purchasing 6 t0 8 dining chairs, the cost can really ramp up. Avoid the leather and upholstered chair that will just add 00’s to that total. Search for a polypropylene, or acrylic chair. They are modern, lightweight, durable, and easy to clean. With so many styles out there you can use them in any style of home. The Eames Molded Plastic chair is a design classic. The Ghost chair combines a traditional shape with a modern material for fun twist. The Aria chair is a clean and simple chair that will provide punch in all white or disappear in a variety of transparent shades. Fun end tables: As you come across piece after piece for thousands of dollars, it will make your heart, and wallet, sing to find some of these stylish and affordable side tables. Plus these styles are so cute and versatile how can you resist? The acrylic I-Beam is small scale and easy to place anywhere. 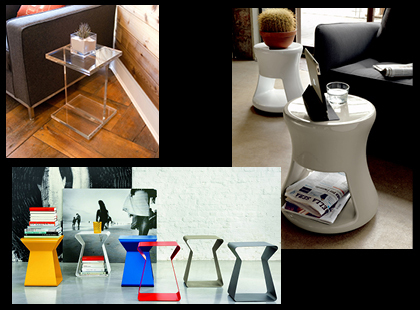 The Ebo table doubles as a stool, and provides extra storage underneath. 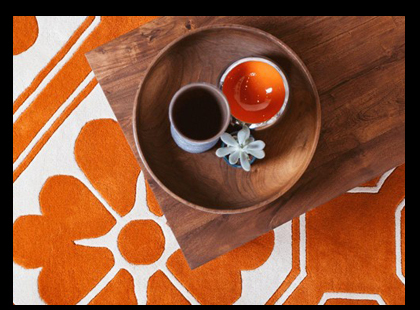 The Kito table comes in fun, punchy colors, and it’s silhouette is playful. Art: You don’t have be artistic to decorate your walls. Get creative. Find vintage magazine photos and do a gallery wall. Scour the sellers of Etsy and obtain quirky prints, pen and paper sketches, and other steals. 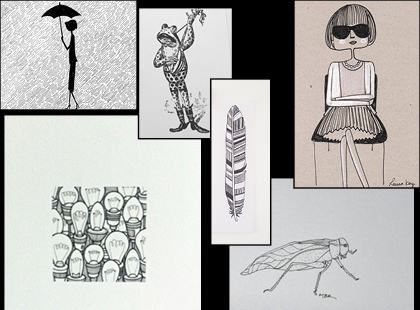 A variety of black and white sketches from Etsy. Group together for a gallery wall, or hang separately to fill that small space. I love the suggestion about the acrylic chairs. They not only provide seating, but do so without taking up any sort of visual space.